Our friends at the Tampa Bay History Center (@tampabayhistory) reminded us via Twitter that today&apos;s the day in 1883 that the South Florida Railroad arrived in Tampa Bay. Railroad baron Henry B. Plant was to west Florida what his competitor, Henry Flagler, was to the cities along Florida&apos;s Atlantic Coast: His railroad tied Tampa Bay to the rest of the country over land, making this region a booming port town almost overnight. Tampa Bay wouldn&apos;t be what it is today without Henry B. Plant. The most visible part of Henry B. Plant&apos;s legacy -- the former Tampa Bay Hotel, with its crescent-topped silver minarets -- has become an iconic part of the city&apos;s skyline. More than a century ago, the Tampa Bay Hotel hosted Col. Teddy Roosevelt as he and his Rough Riders prepared to set sail for Cuba during the Spanish-American War. 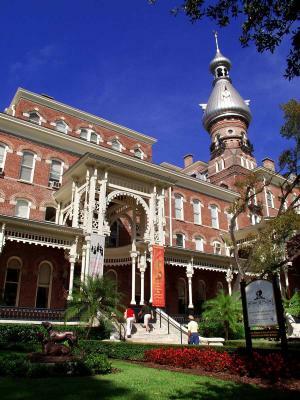 Today, the restored Victorian-era building is part of the University of Tampa. But it also houses the Henry B. Plant Museum, which curates a collection of artifacts from the hotel&apos;s hey-day and tells the story of life in Tampa Bay at the turn of the 20th Century. After you visit the museum, step across Kennedy Boulevard for lunch or coffee at the Oxford Exchange (@oxfordexchange), a unique and multi-faceted restaurant-coffeeshop-bookstore that restored and repurposed the hotel&apos;s old stables. Teddy Roosevelt moved on from Tampa Bay after a few days, but Henry B. Plant continues to resonate in this city -- right down to the bust memorializing him on the Tampa Riverwalk&apos;s Historic Monument Trail. It sits across the Hillsborough River from his remarkable hotel.